Billy Graham has preached the message of Christ’s freedom and forgiveness around the world, reaching over 200 million people in more than 185 countries. He’s had the privilege of leading hundreds of thousands of people to pray to receive Jesus Christ into their lives as Lord and Savior. His integrity and wisdom have opened doors to offer spiritual support and guidance for United States presidents from Eisenhower to Bush. He has been a friend to celebrities, politicians, athletes, and leaders, such as Martin Luther King, Jr., Bono, Muhammad Ali, Johnny Cash, Larry King, and WWII hero and Olympian Louis Zamperini. Billy Graham has been named by Americans as "One of the Ten Most Admired Men in the World,” a record-breaking 59 times with the Gallup poll. He has been known through the years as not only a world-renowned evangelist, but as a kind, non-judgmental, accepting, and humorous soul. His message is timeless, powerful, and relevant for today. The phrase, “the Bible says,” resounds throughout his sermons, and the truth he has preached for years still transcends all barriers of denominational differences, age, nationality, and culture. It has stood the test of time and generations, pointing millions to Christ. 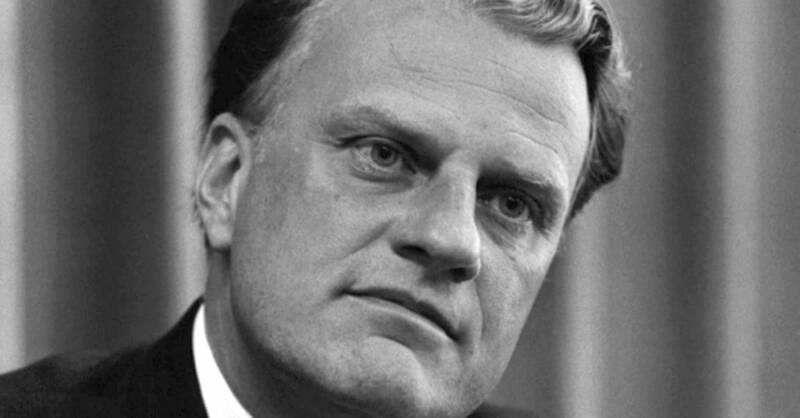 The Reverend Billy Graham has preached God’s Word with conviction and passion for over 60 years. Here are just a few of his words of wisdom. "Mountaintops are for views and inspiration, but fruit is grown in the valleys." “When we come to the end of ourselves, we come to the beginning of God." "The message I preach hasn't changed. Circumstances have changed. Problems have changed, but deep inside man has not changed, and the gospel hasn't changed." "The only hope for enduring peace is Jesus Christ." Reverend Billy Graham, who will turn 97 this year, shared these words in a 9/11 message in 2001 from the Washington National Cathedral. They still give such reassurance in the struggles we face in this world. That hope he speaks of so passionately is the powerful message of Christ and the cross. In Reverend Graham’s last message in 2013 video-recorded My Hope America, he shares his heart for our nation today, and this simple, yet powerful prayer, a final reminder, that if we’re willing to come to Christ, he has the power to change our lives and future forever. “Our country's in great need of a spiritual awakening. There have been times that I've wept as I've gone from city to city and I've seen how far people have wandered from God. I want to tell people about the meaning of the cross. Not the cross that hangs on the wall or around someone’s neck, but the real cross of Christ…With all my heart I want to leave you with the truth, that he loves you, and is willing to forgive you of all your sins. Sin is a disease of the human heart….There is no other way of salvation except through the cross of Christ. Today, I’m asking you to put your trust in Christ. 'Dear Heavenly Father, I know that I’m a sinner, and I ask for your forgiveness. I believe you died for my sins, and rose from the dead. I turn from my sin, I repent of my sins, I invite you to come into my heart and life. I want to trust and follow you as my Lord and Savior. Debbie McDaniel is a pastor's wife, mom to three amazing kids and a few too many pets, dramatist and writer. She has the heart to communicate God's hope through the everyday moments of life - the good, the bad, the ugly, and the ones that take your breath away. A lover of every sunrise, forever needy of His grace, this Texas girl finds joy in the simple gift of each new day. Debbie invites you to join her at www.freshdayahead.com, and Facebook and Twitter.